I didn’t notice that Saturday was Valentine’s day when I arranged to go and review She Loves Me on that day. Once I realised, I wondered if I would look a bit strange going to a romantic musical on my own on the day for celebrating the pairing instinct! I needn’t have worried. There were a lot of couples (and quite a bit of hand-holding), but there were also people who had come because they had friends in the cast, so I didn’t stick out like a spare thumb. Seated at the end of the front row I had a good chance to look at the set (courtesy of designer David Shields and Lighting Designer Richard Lambert) before the performance began. It was wonderful! 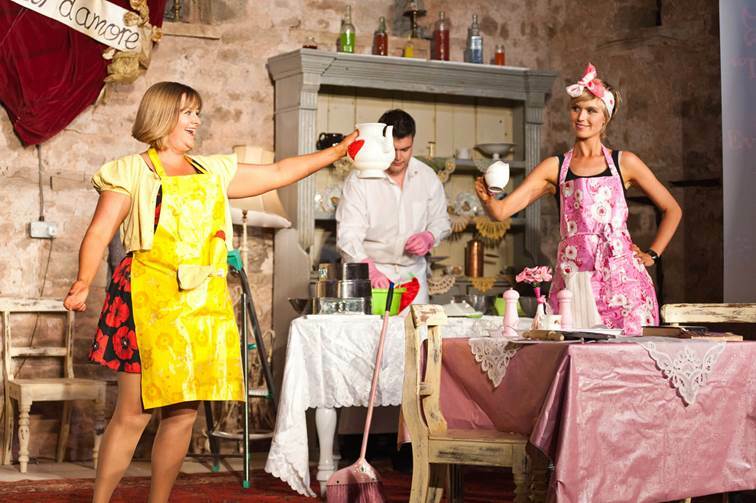 She Loves Me is based on a play called Parfumerie (by Hungarian author Miklos Laszlo) and most of the action is set in a cosmetics shop. The set was well-designed: bright, cheerful and colourful; as well as being easily adaptable to the requirements of different scenes. I did have one major gripe about this show, which nagged at me right up until partway through the second half, when I suppose I got used to it. The play is set in Budapest and is being performed in a London theatre. So why is everyone speaking in an American accent? Yes, I know the musical was first produced on Broadway, but that seems insufficient reason to me. And although the accents were, on the whole, excellent, they did slip on the vocal numbers in some cases. Looking at the cast list, I can see that one cast member is from the US and another from Canada. Let them speak in their native accents, and let the rest of the predominantly British cast speak in their own accents. Were an accent change indicated, the only logically choice would be Hungarian, and I don’t believe that would be either practicable or effective. Accents aside, I really liked She Loves Me. The fourteen-strong cast gave flawless performances with high energy throughout. The songs were exuberant and infectious, and the choreography was of a very high standard – essential when you have such a large cast in such a small space. Credit is due to director Robert McWhir, musical director Iain Vince-Gatt, and choreographer Robbie O’Reilly. The cast were ably support by a trio of musicians whom I can’t seem to find listed in the program and Nina Morley’s costume design and Cecily Rabey’s stage management contributed to the excellent overall look and feel of the piece. With such a large cast, all of such a high standard, it is hard to pick anyone out for special mention. Lead actors Charlotte Jaconelli and John Sandberg were wonderful, both vocally and in terms of creating believable sympathetic characters. The same could be said Emily Lynne, David Herzog and Matthew Wellman – although without the sympathetic part in his case, as he was playing the villain! 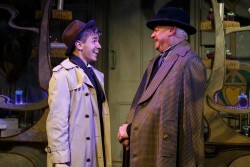 I was particularly drawn to Joshua LeClar as the bicycle messenger Arpad and Ian Dring as Mr Maraczek, the elderly shop owner. All of the singing in the show was brilliant, and I particularly enjoyed the chorus numbers (George Mulryan, Rosie Ladkin, Tom Whalley, Olivia Holland Rose, Luke Kelly, Anne Horn and Suzie Chaytow). At 2 ½ hours the show is good value for money, and I can guarantee you will leave with a smile on your face. 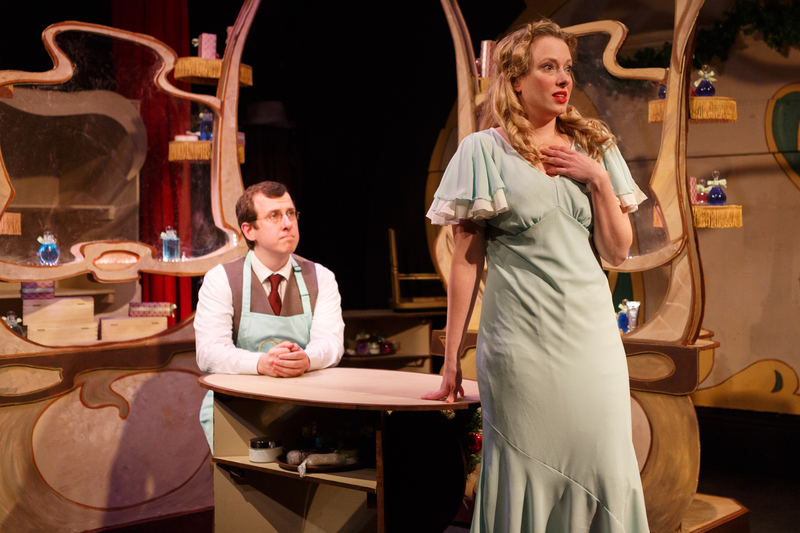 She Loves me is at the Landor Theatre until 7 March 2015, Tuesday – Saturday nightly at 7.30pm, with matinees on Saturday and Sunday at 3pm. For more information, visit www.landortheatre.co.uk. You probably know more Jacques Brel songs than you think. Ne Me Quitte Pas, anyone? How about No Love You’re Not Alone (incorporated in David Bowie’s Rock ‘n’ Roll Suicide)? Terry Jacks’ Seasons in the Sun was Le Moribond with a new lyric, while Scott Walker had a hit record with Jacky in the late 1960s. Singer songwriter Brel was born in Belgium in 1929, moving to Paris in 1953 to pursue his career in music. Although he died young (aged 49) he left a remarkable legacy of chansons behind him, many of which focus on the darker side of life. “Jacques Brel is Alive and Well and Living in Paris,” a musical revue of his work, was first produced in New York in 1968. The show reflects his strong anti-war stance, and features songs in English, French and Flemish. 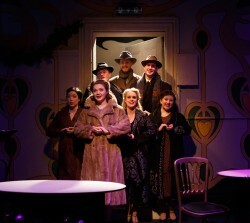 The Charing Cross Theatre production has a heavy cabaret feel to it, which is all to the good. The first half was enjoyable: Eve Polycarpou opened the show with Le Diable (Ca Va), followed by Daniel Boys and Gina Beck, who made a favourable first impression with If We Only Have Love. Musical Director and Pianist Dean Austin sang a brief solo with Le Moribond, and I particularly liked the closing number Amsterdam, powerfully sung by David Burt, which gave a flavour of what was to come after the interval. I would have liked to hear some harmonies on The Desperate Ones, which was sung in unison by the full company, but by the time I got to the interval I was already impressed and looking forward to what was to follow. Despite some feedback problems on the sound front, especially during “Middle Class” (which was a shame, as it was otherwise a very amusing number from David and Daniel), the second half blew me away. Eve’s Ne Me Quitte Pas was profoundly moving, and Gina’s “My Death” totally rocked. I’ve been lucky enough to see the wonderfully talented Camille O’Sullivan perform both of these, plus Amsterdam, live on more than one occasion, and Eve, Gina and David’s renditions in no way suffered by comparison. Daniel Boys also gave a consistently strong performance throughout, with his Next being a particular standout. Overall, the second half seemed to build to a final crescendo, with the full cast joining in for a reprise of If We Only Have Love at the end. The four singers were ably supported on stage by band members James Cleeve, Felix Stickland, Doug Grannell and Richard Burden, as well as by Dean Austin as previously mentioned. This excellent show was directed by Andrew Keates, and is well worth a viewing. Jacques Brel is Alive and Well and Living in Paris runs until 22 November 2014 at the Charing Cross Theatre, Monday – Saturday 7.45 pm, Saturday matinees 3pm. Tickets are available from www.charingcrosstheatre.co.uk. Popup Opera present L’elisir D’amore at Blacks, Soho. As operas go, L’elisir D’amore stretches the viewer’s credibility surprisingly little, story-wise. Donizetti’s opera is a simple story of unrequited love which becomes requited, with merely a love potion, a flour magnate and a wealthy uncle to complicate things, which allows one to concentrate upon the music and the performance, both being worthy of our attention. Popup Opera specialise in unusual spaces, and this venue (a small room in a private club in Soho) is certainly that. Reminiscent of Studio 503, where I saw some wonderful Chekhov last year, the performers are almost literally in your lap. (Ricardo Panela, making his entrance as Belcore, tripped over my feet, looked at me and said “I’m sorry” and then started to sing). This close up view allows the audience to appreciate much that might go unnoticed in a larger space in terms of emotional acting, and also the ‘comedia’ style, which the company employ to great effect. A common reviewer’s complaint is that it is difficult to single out individuals for special praise; in this case it is impossible: not because nobody stood out, but because everyone was outstanding. Cliff Zammit Stevens, as Nemorino (the only tenor role) played the lovesick young man to perfection and gave a piercingly beautiful rendition of Una Furtiva Lagrima (the opera’s most famous aria), despite performing it with a box of man-size tissues in hand. Ricardo Panela gave a commanding performance as Belcore, the pyramid flour salesman who almost wins the girl. Thomas Kennedy put his rich baritone and pantomime skills to excellent use as Dulcamara, the patent medicine man. Penelope Manser is a powerful soprano and talented comic, who really came into her own in the second act. Clementine Lovell was seemingly effortlessly delightful, charming and compelling both vocally and in terms of stage presence throughout as Adina. Add to that the fact that Clementine is also the producer (aided by assistant and extremely creative stage manager Fiona Johnston) and founder of the company, and my admiration is guaranteed. It is difficult in a small venue to keep the volume to a comfortable level while still keeping full passion and power in the voice, but all five of the singers managed this brilliantly. Musical director James Henshaw provided strong musical accompaniment which ranged from highly moving to, at times, having the flavour of a silent comedy movie. Harry Percival’s quirky captions also contributed greatly to the humour of the piece (they’re funny, yeah?). Darren Royston did a marvellous job, both as director and MC. 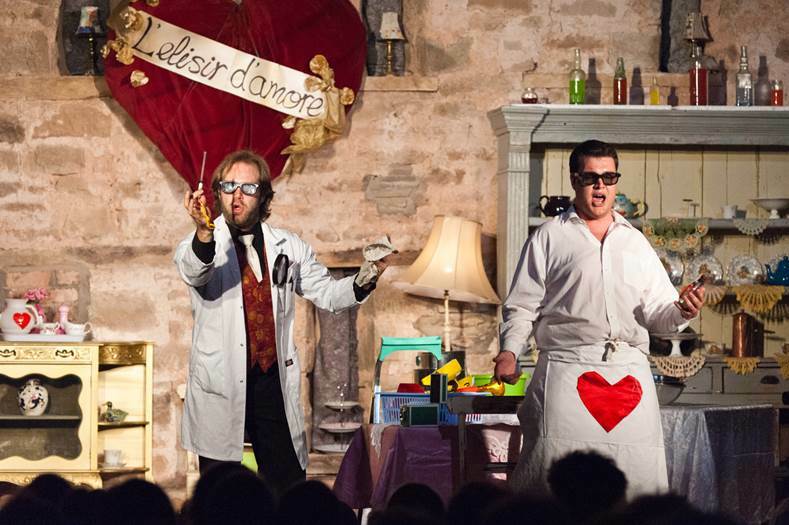 L’elisir D’amore will be popping up at various venues around London throughout April. For more information visit popupopera.co.uk. Having been asked to review the recently re-launched Karoake Box in Smithfield, I duly rounded up a posse and proceeded to check it out on Friday night. After a couple of last-minute cancellations, our group consisted of three musical theatre professionals, two old hands at karaoke, and one “virgin” who had no intention of singing. The first thing that struck me on arrival was the staff who were friendly, welcoming and helpful, particularly bar manager Paolo Espinosa, who set everything up in the room and showed me how it all works, and Lois Roberts on reception. The second was the venue itself: the bar area was airy and very tastefully decorated, as were the booths which also had interesting lighting systems. On a more prosaic note, the toilets were lovely and clean. All of our troupe enjoyed the privacy of the booth setting, feeling “quite relaxed as opposed to standing up and singing in a bar,” and our non-singer had lost her virginity within 20 minutes (to Suzi Quatro’s “Can the Can”), saying “as a virgin singer I felt very safe to sing (there).” Another guest loved that the booths allowed separate parties to enjoy themselves without risk of intrusion and the ability to talk and be heard. The playlist also came in for praise: with over 9,000 songs, everybody found something they knew. The background videos caused some hilarity in our party, with the suicidal goat being the highlight of one person’s night! The only complaints were about the system itself: several of the songs were quite badly out of sync; and there seemed to be quite a long wait between songs, even when they were queued up. A key change facility would also be nice, as I believe people who take their karaoke seriously often look for this facility. However, the mikes worked very well; it was very easy to adjust the mix between backing and vocals; and the screen was a very good size. We were in Room 3, which according to the website is a 14 person room, although I think that would be rather crowded and I wouldn’t personally recommend more than 10 people for comfort. This room costs £70 per hour before 9pm and £98 per hour afterwards. While this seems quite expensive, it doesn’t actually work out to much more per head than people pay for children’s birthday parties or a visit to the cinema. The bar at Karaoke Box is well stocked, and cocktails and pizzas are both on sale (although we didn’t sample either). I would recommend Karaoke Box to anyone who seriously enjoys karaoke, as it is much more pleasant that waiting for hours in a crowded bar just to get to sing once or twice. It’s also ideal for birthdays, hen parties, office parties or for anyone who enjoys an activity-based night out. Rooms vary in capacity from 2 to 30 people, and in price from £20 to £210 (for the VIP room) per hour. For more information, visit http://karaokebox.co.uk/smithfield/ or telephone their friendly staff on 020 7329 9991. I had great plans for the London film festival, with many press screenings marked out on my diary. Unfortunately timing was against me, as it turned out to be a very busy period in my other two jobs (acting and teaching), and apart from “A Liar’s Autobiography,” which got cancelled (read the article here), I actually only ended up at two screenings. But they were good ones. My regular readers (if there are such people) will be aware that I enjoy a bit of music from the 1980s, so I was in a positive frame of mind when I turned up to see Good Vibrations – The Story of Terri Hooley. For every Richard Branson, there are probably hundreds of Terri Hooleys. Known as the Godfather of Ulster Punk, Terri was the owner of Good Vibrations record shop and label, was responsible for discovering the Undertones, and encouraged punk and alternative music to flourish during a dark time in Northern Ireland’s history. I imagine that there were people like him in towns and cities all over the UK and Ireland during the 70s and 80s; running record shops, managing and/or playing in bands, and organising events. Do these people ever make a profit in the long run or do their charming mix of naivety and idealism work against them in the end? Good Vibrations never released a top 40 record, and Terri sold the rights to “Teenage Kicks” for £500 and a signed photo of The Shangri Las (which he never got.) But that isn’t the point, as this film shows: Terri Hooley made a lot of people very happy, which was in itself no mean feat in Belfast at the height of the troubles. This was a highly enjoyable film from start to finish. Richard Dormer made an excellent Terri, and I particularly enjoyed Jodie Whittaker’s performance as his wife. It’s hard to pick out anyone else as cast lists are not given out at press screening, but everyone performed very well. It would have been nice to have a few more female characters – maybe some girls who hung around the record shop for instance – but apart from that I completely loved it. One particularly memorable scene is when an RUC officer is hassling a girl in a bar for suspected underage drinking and Terri comes over and tells him he’d like to report a civil war. Scenes like these show the bravery of the character as well as the naivety and idealism. Of course, being a film about music, the soundtrack is a major part of the experience. Set in a fertile time for Northern Irish music, the tracks chosen add to the energy and exuberance of the story, as obviously does the setting with its air of menace just under the surface. Go and see this if you’re interested in music, Belfast, or just plain enjoy a good film. Good Vibrations is a true story about a real man, with a real record shop/label, and the punk scene in Belfast, whereas Spike Island, my second choice of film, is a coming of age drama set in Manchester in the 1990s with the music of the Stone Roses providing more of a secondary theme. As such it worked well, and the soundtrack (a mix of the Roses and the characters own band, Shadow Caster) added greatly to the ambience and power of the film. The characters did seem to blend into each other a bit at points, and some of what could have been more potent moments could have been better explained (I was never sure why one boy joined the army for instance). Having more female characters would have added more variety, and this film does not have the excuse of being a true story as a reason for not doing so. Teenagers since the 1960s or 1970s onwards generally tend to hang around in groups of both sexes (I did) and the whole male bonding theme seemed to me a little old-fashioned. Once again, I am hampered by a lack of a cast list, however everyone concerned gave a very competent performance, with Emilia Clarke standing out in particular. Go and see this film if you enjoy a good coming of age drama with an excellent soundtrack, or want to recapture your youth!